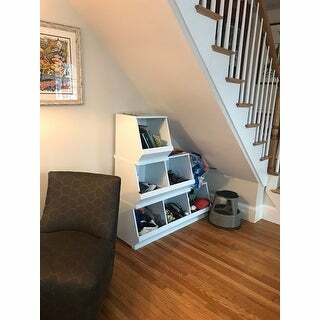 Be creative in the way you organize your home with these stacking storage bins by iNSPIRE Q Junior. Available in six different colors, the set comes with 1-3 boxes, based on your needs. They are designed to stack securely on top of each other with the option to screw them in for even more stabilization! iQ Junior offers playful colors, patterns and finishes that will light up the imagination of your little designer. Made to grow with your child, this collection has pieces that are both fun and functional, perfect for toddlers and teens alike. Give kids a space of their very own that will inspire creativity and fun with iQ Junior. Love these even more in person! 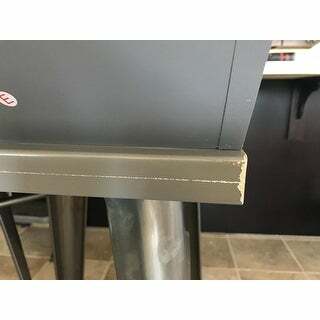 You can't tell from the pictures but when your stacking these they're designed so that they sit securely one on top of the other and you even have the option to screw it in for an even more secure fit. Perfect storage solution for my son's toys. He can easily find what he wants and can't reach the things I don't want him to touch in the top cubbies!! Built well and worth every penny. This is a great quality, attractive, sturdy and well priced toy storage solution. I ordered the grey and i would consider it to be a dark grey. I purchased a 3 box, a 2 box and 3 one boxes. I will be ordering another 3 box unit. Perfect for little ones. We have only the one 3 part unit and we feel it is very safe as our grandson crawls to it, pulls toys out and pulls himself to a stand on it. Very sturdy! Love these! They are large, very sturdy, hold a ton of stuff, and look great. I bought a set of three, a set of two, and a set of one and stacked them like stair steps. 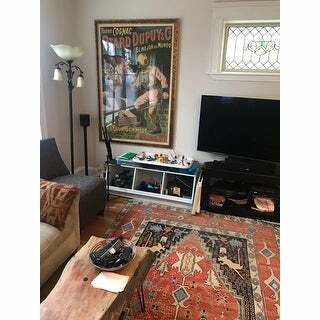 We did not connect the sets in the back (they came with connectors) because we wanted to be able to move them easily but they stack together so nicely it is not a problem. If you have a small child you may want to connect them in case they tried to climb on them but these were for my son who is a young teenager. He wanted to display his trophies on top and they work perfectly. 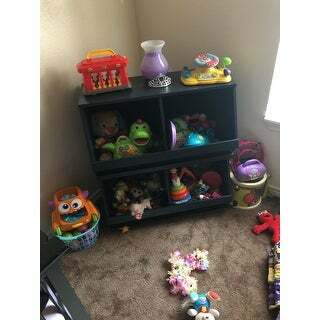 These are high quality pieces of furniture that don’t scream “toy box” even when filled with toys. They were easy to assemble, and work great for storing all of my kids toys in the basement. The gray color is beautiful, and I feel the piece can transition even as my children get older. Second time purchasing these...that probably says more than anything else. Originally purchased to hold toys, stuffed animals, and books in my son's bedroom. Worked great for that but the double high and three wide version was too big for his new room. We're using the original set in a play room and just ordered a smaller version to hold books and toys in his new bedroom. Assembly is a bit of a pain, but no more than other furniture in this category and price range. Materials are adequate for our purposes. The fiberboard can split if you're not careful but in general, it's a pretty sturdy piece. Love this product! So sturdy compared to other box store cube organizers! Easy to put together, heavy piece of wood. Stores a lot! Bought it for my toddlers boys room and it looks great under a window! Good quality. These really help keep our playroom organized. Also, the depth is just right for little kids to easily find what they're looking for. I highly recommend! These are PERFECT for my girls who aren't so great at organizing (3 and 6) so they can toss their tiny toy pieces in the bins and get them up and out of the way! Very sturdy, easy to put together. I will gradually be buying more to stack on top of the three section piece we started with. They work great. Really wanting to get more in the future!! 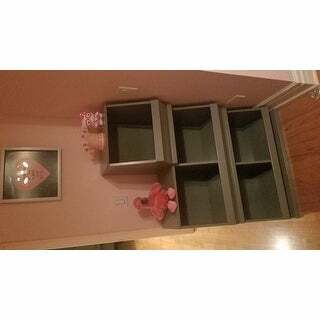 Great storage bins to keep my daughter's toys and books organized and put together. you only get 1 box for 50 or more dollars, not such a good deal. Absolutely loving these storage bins! Opted for these over the much more expensive storage systems from PB/C&B/RH. It was a great decision. High quality, looks great, fits a lot of books and toys inside! So cute and sturdy! I bought 2 and stacked them. My kids have an easy time taking out their toys. These are extremely well constructed. Sturdy and easy to assemble. These are being used in a psychotherapy office with children and they are indestructible. "Charcol Black" is Navy Blue, which is great if that's what color you are looking for. The quality is also just OK. It also comes in a pizza box, so you are assembling it as if you bought it from . So for such a pain-in-the-neck-assemble-yourself project, it's VERY expensive. I've returned it and will be spending the extra $ to buy something similar (and blissfully already assembled!) from. Buying more to stack, very nice product! A little pricey is the only negative. Shape and color are exactly like the pictures. Nice pierce for bedrooms, offices, or even classrooms. Love everything about these. They were easy to install and holds all of my little man’s toys. He loves being able to take all of his toys out and put them away again. They are also very sturdy. These are great for sorting and storing all the little toys. The only issue I had with them is that The front piece is bowed due to a flaw in the design. It's not noticeable though. Easy to assemble and good quality product. I am very disappointed in the color--the Charcoal Black is looking very blue. I also wish it were a little less shiny. "Does each box have to be assembled"
"Can these be mounted to the wall?" Unfortunately we do not recommend mounting this item to the wall. "To me these seem very expensive for one little box. Maybe I missed it but what is the max weight capacity each box can hold?" The weight capacity is 25 pounds. 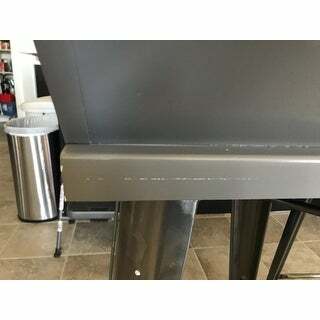 "Could these be stacked side by side to form a bench for sitting?" The individual pieces are designed to stack securely on top of each other with the option to screw them in for even more stabilization. "Is the white an off white or bright white?" This is more of an off white. "Is the charcoal black a true black or more like a dark gray?" Hello, it is more Vulcan Black. "Can you stack 3 of the 1 box option on top of each other to create a small tower of 3?" Yes, you can stack three of the one box option on top of each other to create a small tower of three. Adding your favorite mementos and cherished items to your shelf or bookcase helps create a feeling of warmth and coziness, all while making your home more beautiful. 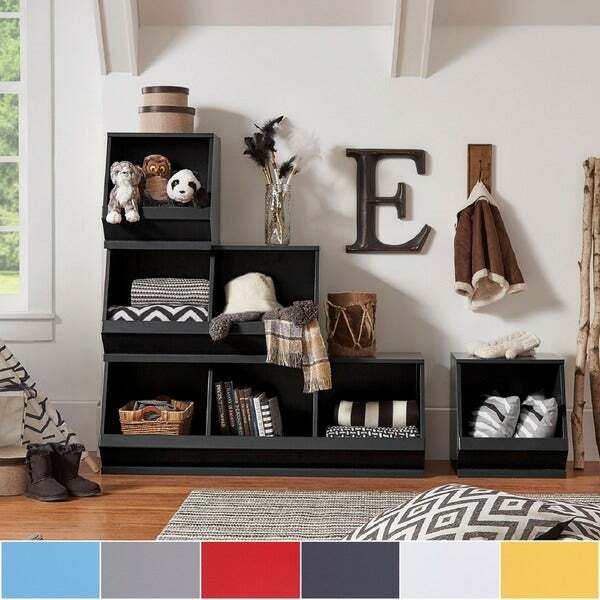 Check out these helpful tips on how to decorate shelves, and turn your ordinary bookcase into a gorgeous display of your personal style. Setting up a comfortable and easily accessible reading space will encourage your children to explore the wonderful world of books. You'll find everything you'll need at Overstock.com.